Event logo from the Solar Eclipse Marathon Facebook site. What better way to endure a grueling 26.2 mile race than with the excitement of a total solar eclipse in the sky above? That’s what the city of Port Douglas in Queensland, Australia is planning with the first-ever Solar Eclipse Marathon. 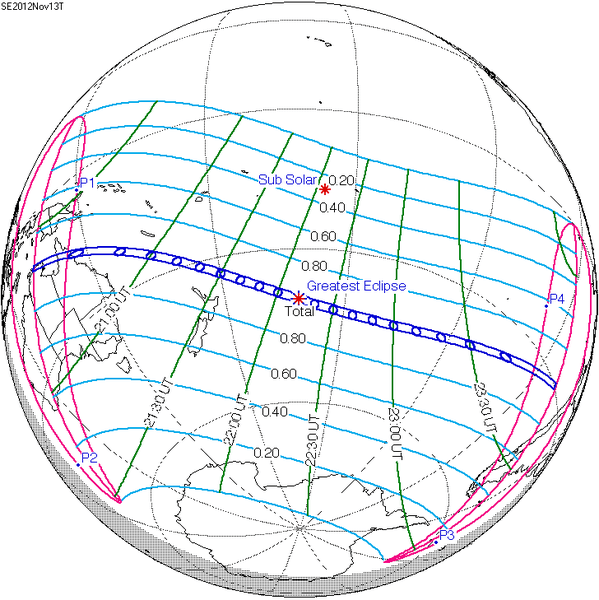 The next total solar eclipse will occur on 13-14 November 2012, with the event crossing the International Date Line such that those in Australia will see it on very early on the 14th, while those in Chile will see a partial eclipse near sunset on the 13th. There is a very narrow strip on the planet that will be under a total eclipse. Of that very narrow strip, only a very small percentage will be on land, including Port Douglas. The city of Port Douglas is a popular vacation location, with easy opportunities to take a tour of the Great Barrier Reef. The marathon website is full of information for how foreigners can turn the race trip into a full-fledged northern Australia vacation. Are you up to the challenge? Well, get out your checkbooks along with your eclipse glasses and pinhole viewers: Simply running the race will cost folks AU 310 (US $316)! The website is set up such that tourists are asked to purchase a “holiday package” as well, which includes the lodging and a day trip to the Great Barrier Reef. As we always do here among the GeekMoms, we thought about the many other “themed” races that are popular around the world. This fun list came out earlier this month. I was tickled to see the runDisney races on the list, as well as the Run for Your Lives races, the Warrior Dash, and the Krispy Kreme Challenge … all of which are on my bucket list. How many of these races have you done? Are you going to try to run in the Solar Eclipse Marathon?